In night departure from Mumbai by Avantika express. Morning at 7.20 am reach Ujjain. 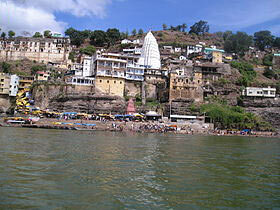 Visit and stay at Ujjain. Ujjain : Second place in 12 Jyotirling (Mahankaleshwar) Sidhvat (Thousand years ago tree) Sandipani Ashram, Big Ganpati, Kaal bhairav, Bhatruhari Gunfa, Harsiddhi & kshipratat etc. Travel from Ujjain to Indore. 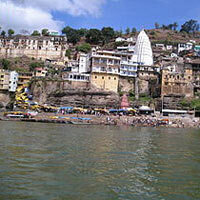 Visit Omkareshwar. Stay at Indore. Indore: Kach Mandir, Annapurna Mandir, Geeta Bhavan, Bada Ganpati, Lalbagh Mahal, Meghdoot Upwan. Omkareshwar : One of Jyotirlinga of 12 Jyotirlinga, Maheshwar:- One ghat which is founded by Ahilyabai Holkar and situated near Narmda river. Visit Dhar and Mandu. Stay at Indore. Dhaar: Late Shri. Fadke’s Studio. Maandu: Nilkantheshwar, Ranirupmati mahal, Echopoint, Hindola mahal, Baj Bahadur palace, Jahaz mahal & Jaama masjid. Travel from Indore to Bhopal. Stay at Bhopal. Bhopal and Sanchi Visit. Stay at Bhopal. Bhopal- Saanchi stoop constructed by Ashoka, Bharat Bhavan, Birla Temple, National Park, Gunfa Mandir, Museum. Bhopal - Panchmadhi, stay at Panchmadhi. Panchmadhi visit Stay at Panchmadhi. Panchmadhi - Sunset point, B fall, Dhupgad, Pandavleni, Gupthmahadev, Bada Ganpati, Handikho. After seeing Panchmadhi bhedaghat stay st Jabalpur. Jabalpur -Bhedaghat, Visit Narmada river. Visit Jabalpur to Kanha and stay at Jabalpur. Kanha - National Park. After seeing Khajuraho and Jhansi. Stay at Gwalior. Jhansi - Jhansi rani fort. Gwalior visit and stay. Gwalior Vijayaraje Shinde palace and fort. In morning leave for Mumbai from Gwalior by train.